No more, because Sandhya Menon has written When Dimple Met Rishi, a – if we’re searching for a quick pitch – YA arranged marriage rom com. And reading When Dimple Met Rishi was one of the best, most joyful reading experiences of my life. It starts with the cover (and I know you shouldn’t judge), which depicts a brown girl, smiling widely, wearing henna and a kurta, and sipping an iced coffee. It’s joyful. Here’s a book about a brown girl, and she’s not oppressed, and it’s not about terrorism or struggles with religion or culture. Instead, it’s a book about a brown girl with slightly overprotective parents, who get on her nerves sometimes. It’s a book about a brown girl with big dreams doing everything she can to make them come true. It’s a book about a brown girl navigating friendships. And it’s a book about a brown girl falling in love with a guy she never expected to like. I don’t have lots in common with Dimple – she’s American, of Indian heritage, and Hindu. But what we do have in common is that we grew up in families with dual cultures, and with two languages. Menon seamlessly melds those two languages and cultures together – Dimple wears kurtas with jeans; her mum wants her to wear kajal while Dimple will happily stick with eyeliner (or no make up at all); Dimple and her family (and Rishi and his family) speak to each other in a mix of English and Hindi; and the film and TV references are from American and Indian cultures. But that’s not to say anyone who isn’t brown won’t get When Dimple Met Rishi. So much of the book is about universal experiences – finding love, dealing with awful people, learning how to communicate with your parents. Reading When Dimple Met Rishi is like sinking into a warm bath – comforting. I got caught up in the novel, which is fun and sweet and cute, and found myself laughing out loud at times, and at other times had tears in my eyes. 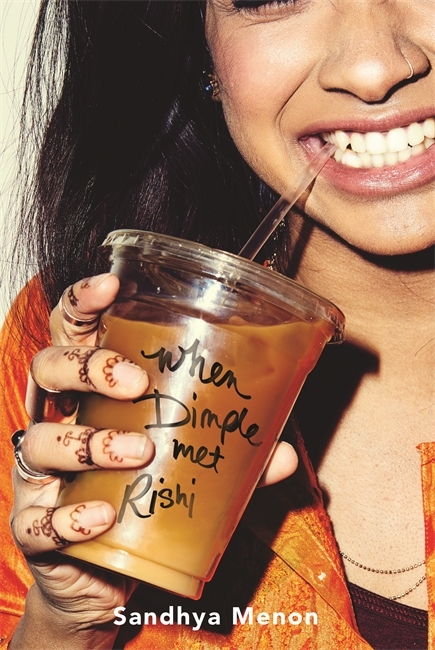 When Dimple Met Rishi is essential reading for anyone who loves rom coms, and it’s also a book I want to press into the hands of every young Asian kid who feels like they don’t belong in a book. Because When Dimple Met Rishi will show them that they do.